Camping Nautic Almata - Sunny skies, deep blue see and every camping luxury. Nautic Almata provides the very best of what luxury camping requires and a mobile home rental here via LuxCamp allows campers to experience a truly unique camping holiday. 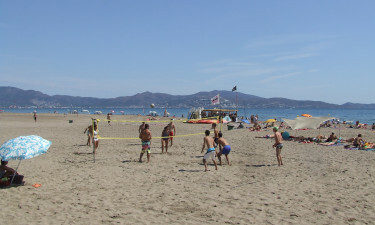 Situated in the renowned Costa Brava, this luxury camping site exudes fun and relaxation for all. Whether individuals want to exert minimum energy on their camping holiday, or take on the waves on a Jet Ski, this luxury camp will make the experience memorable. If the magnificent natural setting of this holiday camping site does not immediately revive the body and spirit, an acupuncturist and masseuse stand ready to kick-start the process. Luxury camping here is all about the all-around well-being of campers. Why choose Camping Nautic Almata? 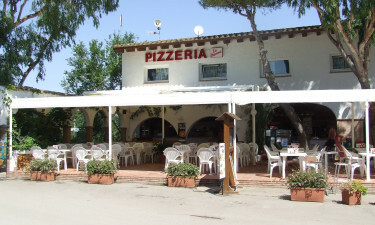 Takeaway meals and an ice-cream parlour. Plenty of organised entertainment for all. The pool area offers a Jacuzzi and free sunbeds for lounging around the large adult pool. 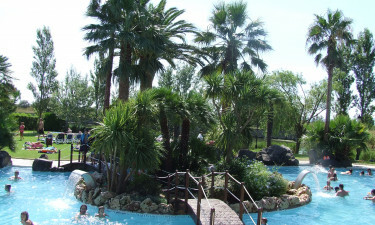 There is a smaller pool for children with extensive surrounding lawns where quite a few organised activities take place. Nautic Almata has direct access to a spectacular beach that stretches for miles. Besides inspiring every type of water sport known to man, campers can enjoy boat rides to explore the breath-taking Catalan region.